Our Community Food Hub in Kirkcaldy project aimed to create a place for people to come together to grow, cook, eat and learn. It centered around the creation of a Community Kitchen in Kirkcaldy town centre and a Horticultural Training Centre at Ravenscraig Walled Garden in east Kirkcaldy. Find out more about the background to the Community Food Hub idea in our previous post: A Community Food Hub for Kirkcaldy. Our Lang Spoon Community Kitchen at 8 East Fergus Place, and Community Training Garden at Ravenscraig Walled Garden offer training, volunteer and work experience opportunities, life-long learning around food production and preparation, community meals and engagement with our community on healthy, sustainable food. In 2018/19 we refurbished the old library headquarters at East Fergus Place, Kirkcaldy. The building now houses our new Lang Spoon Community Training and Production Kitchens, as well as our office and an events space. 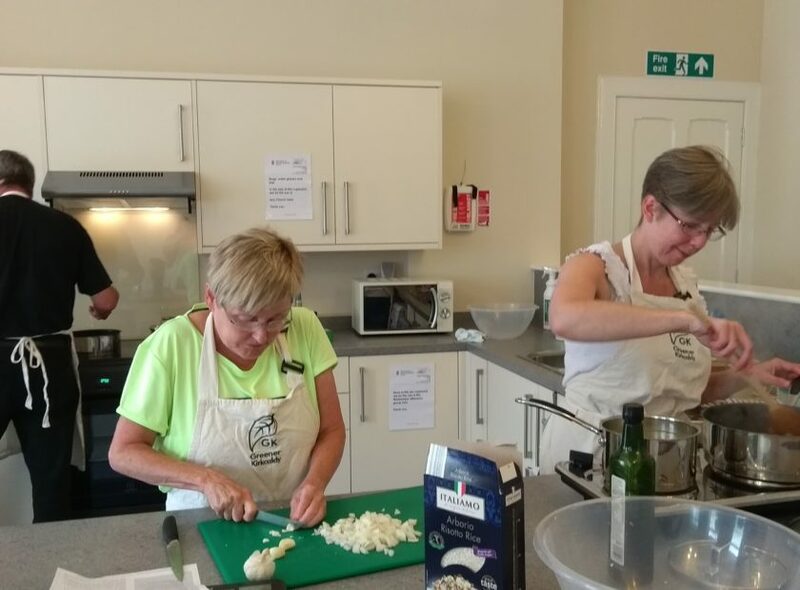 It will host a wide range of events, courses and workshops on all aspects of food and drink – plans include Beginners Breadmaking, Indian Vegetarian Cooking and Eating Well on a Budget. The Food Hub will also include a base for a food Coop promoting local seasonal produce, a pop-up community café, and has a distribution point for Kirkcaldy Food Bank. We purchased the building at East Fergus Place with a grant from the Scottish Land Fund, a Scottish Government initiative which gives funding and support to help communities take ownership of land and buildings for projects to benefit local people. The refurbishment was funded by a grant from the Big Lottery Fund’s Community Assets programme. The grant is also contributing to the Food Hub project’s initial running costs while we develop it as a social enterprise. The refurbishment was carried out by local builders, John Smart & Son. Read More about the Lang Spoon Community Kitchen. Ravenscraig Walled Garden is already a thriving community asset, with individual allotments and plots for community groups managed by Kirkcaldy Community Gardens & Allotments, and our established community orchard. We have recently created a new training garden and room there, which will offer courses, training and volunteer opportunities in gardening and growing your own fruit and vegetables. We’re also working with Kirkcaldy Community Gardens & Allotments and the site’s landlord, Fife Council, on longer-term plans for the development of Ravenscraig Walled Garden. The Garden is part of the historic landscape of Dysart House and Ravenscraig Park and is Common Good land, so we consulted stakeholders, including Fife Council’s Conservation Officer, and agreed to, first of all, develop a Masterplan for the site to ensure that its historic features are protected. We will update this page as the work develops and the Masterplan progresses. Read more about our Community Training Garden.